In March, Captain Marvel became the first Marvel Cinematic Universe movie to focus on a female character (played by Brie Larson), and one whose name recognition will only improve when she helps combat Thanos in Avengers: Endgame. 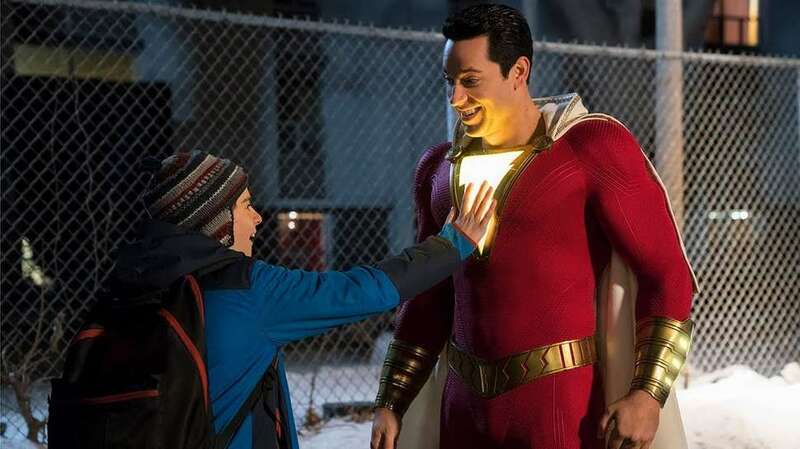 But Shazam!, the latest DC Extended Universe release, is about a superhero (played by Zachary Levi) who used to be called Captain Marvel, at least in the comic books. If that sounds confusing, the history behind the characters is even more complicated. Here's the fascinating story about how Captain Marvel and Shazam went their separate ways. With its February 1940 issue of Whiz Comics, Fawcett Publications introduced Billy Batson, a homeless orphan who follows a stranger into an abandoned subway tunnel (those were some seriously innocent times) and meets the ancient wizard Shazam. Shazam gives Billy the ability to summon the powers of six conveniently named gods and heroes -- Solomon, Hercules, Atlas, Zeus, Achilles, and Mercury -- by shouting their names. The nonsense word summons a lightning bolt that turns him into a red-and-yellow-costumed grownup named Captain Marvel, and saying "Shazam!" turns him back into normal Billy Batson. Captain Marvel quickly became a phenomenon, and the character's success rivaled even that of Superman, who had debuted a year-and-a-half earlier. In addition to a live-action 1941 movie serial (Superman wouldn't get the serial treatment until 1948), Captain Marvel appeared in every issue of Whiz and spawned several spinoffs, among them Captain Marvel Adventures, which published two best-selling issues every month. These additional titles showcased not only the Captain, but also "Marvel family" members Mary Marvel (Billy's sister) and Captain Marvel Jr., whose alter-ego was Freddy Freeman, a newsboy with whom Captain Marvel shared his powers after the subtly named villain Captain Nazi had maimed the kid. Freddy's most-enduring qualities were a cape-and-slight-pompadour look that inspired a young Elvis Presley, and the awkward aspect of his magic word: While Billy and Mary said "Shazam!" to transform, Freddy had to say the source of his powers -- that is, Captain Marvel -- to change into Captain Marvel Jr. That meant Captain Marvel Jr. was the first superhero who couldn't say his own name (otherwise he'd constantly change forms), an unwieldy bit of business that would eventually define the entire franchise. What's in a name? Oh, just billions of dollars. While Captain Marvel had started strong as competition for Superman, the seeds of the character's undoing had been planted in his very first story. A super-strong hero in a brightly colored, caped costume, whose secret identity is a reporter (Billy got a job as a newscaster by the end of his first adventure)? The similarities to the first appearance of Superman in 1938's Action Comics #1 had not gone unnoticed by Superman's publisher, Detective Comics, Inc. (eventually DC Comics). As a legal battle over copyright infringement worked its way slowly through the courts, the superhero boom started to fade. So when a 1950s court ruling sent Fawcett Publications back to a lower court to continue the fight, Fawcett instead caved completely, settling the lawsuit and promising never to publish Captain Marvel again. And since superheroes were seemingly kaput, Fawcett didn't care if anyone else used the word "Marvel" on its comics, an oversight that would change the future of pop culture. In 1966, a fly-by-night publisher introduced an extremely short-lived comedy superhero -- an android that could detach and reattach his head and limbs -- named Captain Marvel. This embarrassment may well have been what prompted Marvel Comics (which had branded itself in 1961) to launch its own Captain Marvel character the following year. This alien hero would appear as Captain Marvel into the 1980s, before the name passed to successors Monica Rambeau and, ultimately, Carol Danvers, the character played by Brie Larson in the movie Captain Marvel. That's how Captain Marvel, who predates Marvel Comics, came into the Marvel fold. In 1972, DC Comics licensed from Fawcett the likeness of the hero they had sued out of existence, and the first-ever Shazam! comic debuted, with the subtitle "The ORIGINAL Captain Marvel" reminding readers just who they'd find inside. That subtitle was replaced in later issues with the tagline "The World's Mightiest Mortal" after Marvel sent DC a cease-and-desist letter. An effort to capture the whimsy of the Golden Age series, this was the first of several attempts to reintroduce the hero in the ensuing decades, among them a Saturday morning live-action series (1974-77) that strove for social relevance with teenaged Billy traveling the nation in a motorhome with an adult "Mentor"; animated episodes with a more traditional approach in 1981's The Kid Super Power Hour with Shazam! ; and appearances in comics series throughout the '70s and '80s that never managed to reignite the character's long-ago best-seller status. After buying the Fawcett superhero library outright in the early '90s, DC launched the retro-styled The Power of Shazam! graphic novel and ongoing comics series, which still used the Marvel name for the characters, if not the title. This version had Cap sharing his power with Mary Marvel (who wanted to be called Captain Marvel herself, because why the hell not?) and the other members of the Marvel family, so they'd get less powerful as more of them used their powers at once. That power-sharing idea was pretty much abandoned in later appearances throughout the '90s and 2000s, whether in cartoons (including a Superman/Shazam! direct-to-video movie), or in the award-winning Kingdom Come comics miniseries, which found Cap under the control of a super-intelligent worm (not a typo) named Mister Mind (also not a typo), who had bedeviled the hero since the '40s. But as licensing money became a bigger part of superhero success, it was obvious that DC's Captain Marvel -- who had to go by "Shazam!" on the front of comics, books, kids' costumes, and toy packaging -- could never again be a household name. By the early 2000s, the Marvel Family's main representative in the DC Comics universe was Black Adam, an opposite number to Captain Marvel introduced in the Golden Age (he'll be played by The Rock in the DC movie-verse), but Captain Marvel stayed largely on the sidelines until 2012, when writer Geoff Johns (later DC Entertainment's Chief Creative Officer) joined artist Gary Frank for a series of stories that restarted the hero -- now as "Shazam" -- as part of DC's "New 52" reboot. A slightly older, more-cynical teenaged Billy Batson lives in a foster home alongside Freddy, Mary, and a diverse roster of kids who would become part of the "Shazam Family" after Billy was given his powers. This version, largely the same one found in April's movie, stars in a new Shazam! comic by Johns (with art by Dale Eaglesham) that launched in late 2018. Ivan Cohen is a freelance comics and pop-culture writer who still has his SHAZAM! beach towel from the 1970s. Find him on Twitter @IvanMCohen.